I suspect there are a few different ways to apply weathering powders to your models. I tend to stick with brushes in my application. In a recent post, I had someone ask me about the brushes I use when it comes to actually applying pigments to my models. Powders are something I use one almost every single model I do now. I just enjoy the final look it gives the model. With some things (like greenstuff) the tools you use can get expensive rather quickly. I figured I share what I use for applying powders though. The short answer is cheap ones. Cheap ones that I cut the tips off. I have a few different sizes depending on how big of an area I want to apply the powder to, but none of them are expensive. Once I have an "old" brush that won't be used for painting anymore, it's usually moved over to weathering duty. Sometimes I'll use it for drybrushing or gluing, but if not one of those, it goes in the powder pile. If it's small, I leave it as is, if it's bigger, I'll cut the tip off and make a stipple type brush. The tiny brushes are used to apply powder to recessed areas where I want to show it's collected in a groove or between some armour plates. That would be the two brushes on the far left. 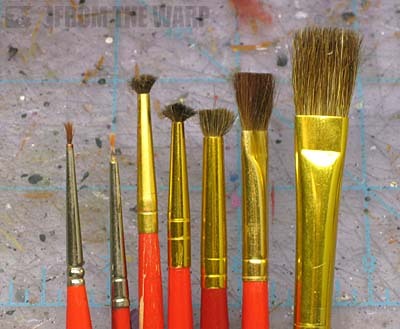 The medium brushes (the middle three) are used to cover larger areas on a model. If I want to cover the lower legs on a model to tie them to their environment for example. Same goes for adding soot stains to a general area. The two large brushes on the far right are for removing excess pigment. I'll gently brush them over the area once the powder has been applied to remove any loose material before either adding more or moving on to the next area. I do keep one small one set aside for applying alcohol over the powders once I have them in place. At least I try to keep it separate from the ones I use to apply the powder, but sometimes I forget and mix it in there. I know exactly what you mean, if you are going to abuse them, old or cheap bushes make it very easy. Fayte: It's how I extend the life of my brushes after they're done with front line painting duty. Sometimes though, I'll deliberately buy the super cheap ones for things like drybrushing. I have some old humbrol brushes I've had since I was 12 which serve as my weathering brushes. They've survived rather well, considering they were used for painting with enamels back in the day. Sendraks: Yikes! And I thought I held onto brushes for a long time. What can I say, I don't throw anything useful away. 20+ years for a brush is not bad innings!